Back in the day, I posted an easy-peasy “ice cream” “recipe”. Quotation marks because said “ice cream” was made entirely from bananas, and the “recipe” was that I added in a pinch of cocoa powder and peanut butter to make it seem more legit. But I recently spotted this post from Tracy at Shutterbean (that’s right, it’s double Shutterbean, two weeks in a row over here) and decided that it was time for my simple ice cream to... mature. 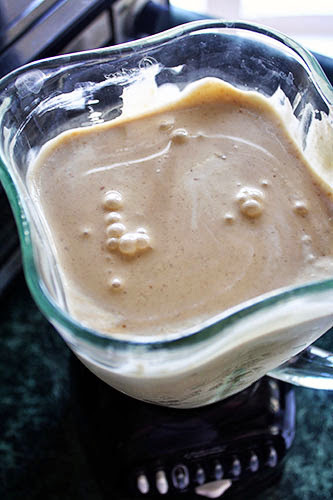 Mature into a peanut butter banana frozen yogurt recipe. NO QUOTATION MARKS, because there is actually yogurt in this, and it is actually a recipe that takes more than three minutes to make. Still! On these hot July days, a good frozen yogurt is a good thing to have in your freezer. And this one is totally worth the trouble! 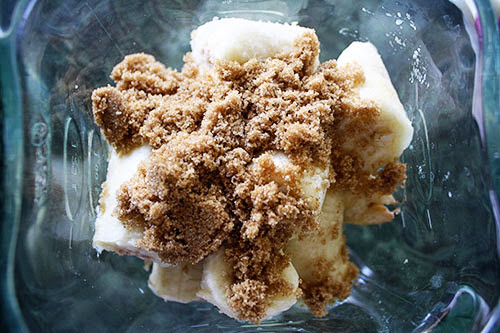 It still starts with the basics: frozen bananas and a quarter-cup of brown sugar, in a blender. Confession: I rather short-sightedly threw the bananas in my freezer still in the peel. Those of you who think about these sorts of things for more than three seconds – unlike me – will surely realize how hard it will be to peel a banana when the peel itself is frozen. So while freezing your bananas will speed up the process, make sure you peel them first! Bonus points for breaking them up! 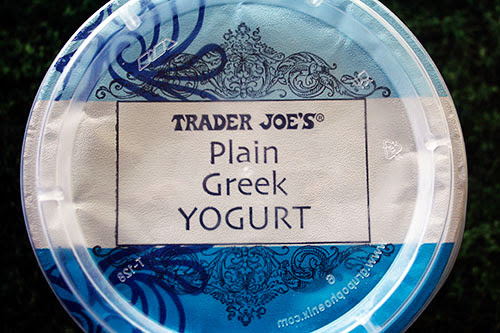 Next comes the greek yogurt. I’m the last remaining yogurt-eating soul on earth who doesn’t like greek yogurt, so I bought this 16-ounce carton especially for this recipe. It was perfect! 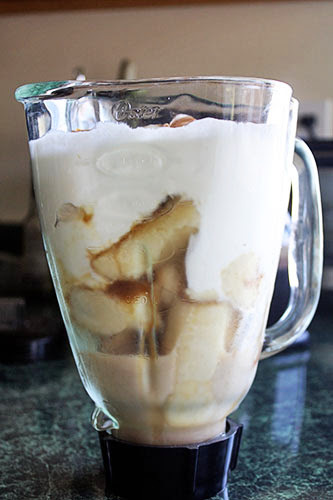 I ran the blender until it was all totally smooth – even the crunchy peanut butter I used, because it’s all I had on hand. It took a few rounds of blending, scraping the sides, blending, scraping the sides... but in the end it came together! Which I later regretted. Tracy used a metal loaf pan, and I thought I’d prefer this container because it had a lid. BUT, it ended up cracking the plastic. Dumb liquids expanding when they freeze. Way to go, scientist. 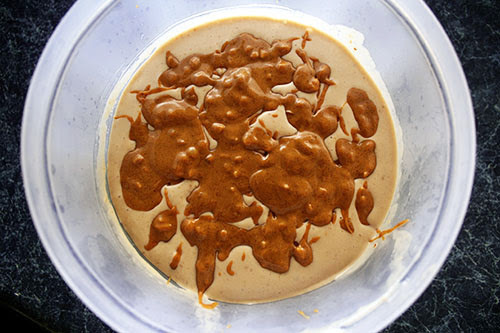 After allowing the froyo to freeze hour and a half, I started making the peanut butter swirl. You heard me. Peanut. Butter. Swirl! 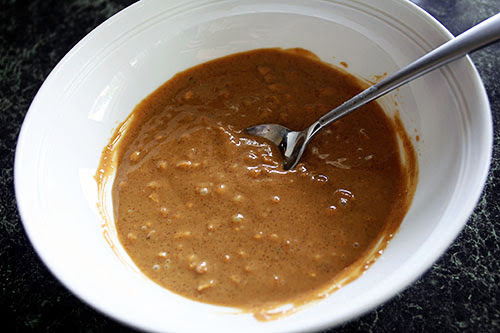 You just need another quarter-cup of peanut butter and a tablespoon of brown sugar. Nuke it until it’s melted, which took 45 seconds for me. 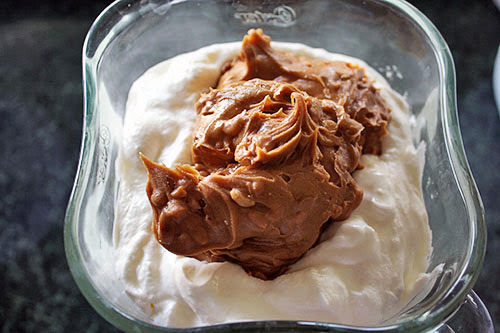 Then gently fold it in to create the peanut butter swirl. Dat’s it! Sounds so fancy and takes all of a minute to do! Then back in the freezer it goes for a few more hours. 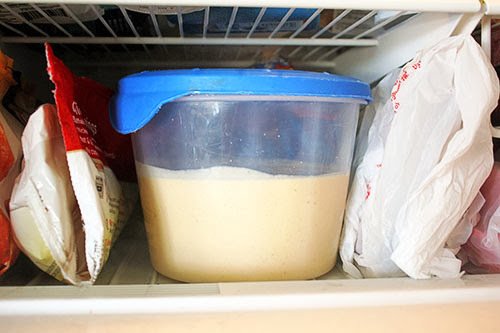 When you’re ready to serve, I recommend taking it out of the freezer several minutes beforehand (even moving it to the fridge a half-hour before would work). Maybe it’s because I used lower fat milk, but I found the froyo to be extremely firm and hard to scoop fresh out of the freezer. Give it some time until it’s scoopable! You guys, this froyo is the Mercedes to my previous Honda Civic “recipe”. The old bananas-only “ice cream” is does its job perfectly – it’s easy, it cures ice cream cravings, it helps you use up old bananas. But this recipe is undeniably more delicious. If you’re willing to go to the trouble of buying yogurt and take the time to get out the blender and so on, DO IT. The peanut butter swirl really seals the deal. I want to swirl peanut butter into everything now. 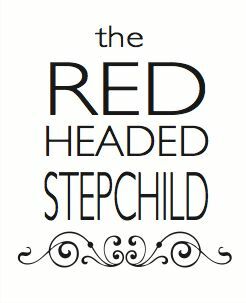 Here’s the deal: I made this when I was home alone, while Mr. P was traveling over a long weekend. When he got back, I offered to scoop him out some froyo for dessert... and honestly said aloud, “Oh. Whoops. I guess... I ate most of it?” There was hardly two servings left. The rest was long gone. INTO MY BELLY. 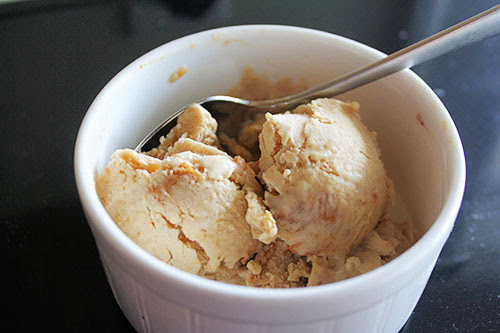 I’m totally going to make this again, and perhaps try it in my ice cream maker to see if that makes it a little less rock-hard out of the freezer. Meanwhile, go visit Tracy for the rest of the deets and cool off with this froyo on these hot July days! Enjoy!